The world has gone crazy in Massachusetts. 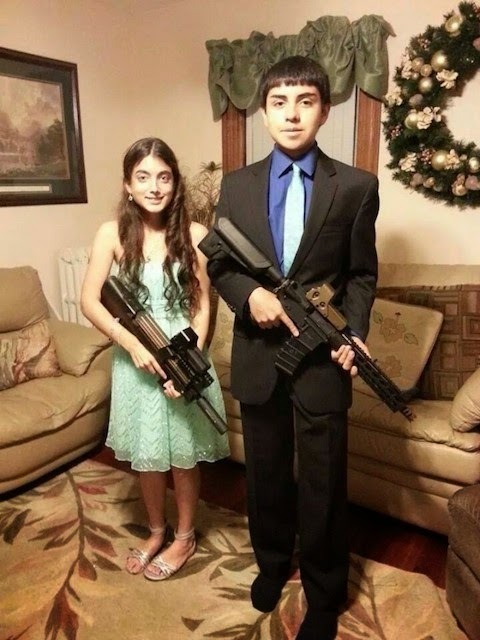 These two kids took this picture at Ms. Pereira's house, left the airsoft guns there, went to homecoming, came back, and then posted the picture on Facebook. Note that the airsoft rifles never went either to homecoming or the school, or even close to school property. “What it's about is a couple of students engaging in an activity that created a total destruction of the school day,” Superintendent Richard W. Gross said. "They're juniors in High School, and it's proactive and they should know better and it scared students." How exactly does a picture posted on Facebook destroy a school day? Does it spawn little Facebook soldiers that march into the building with air-powered pellet rifles? Does it magically remove time from the clock? And what kind of people are scared of this picture? Are you scared of it, Mr. Gross? Because if you are, maybe you need to get some professional help.